I got the pizza bible for Christmas a few weeks ago and the first thing I did was source all my ingredients. I am a bit of a tomato freak and always use san marzano's in my homemade sauces (grow them in my garden as well) so I was insistent on finding and sourcing the ones Tony specifically named as being his favorites . I wanted to try them as I have my local favorites and I wanted to try his. The most frustrating thing is there is no ONE website or source where you can get all the different types of tomatoes (ground, paste, and whole) and in addition get the flour. Normally this wouldn't be a huge issue but due to the weight of the shipment the shipping costs were very high so it would have been awesome to source from one spot. Oh well. Just a word of warning. Amazon was spotty with what they offered. I ended up ordering a case of the organic Strianese from Mugnaini and then DiNapoli from Amazon (cheapest option as I could get them on my prime for no shipping) and also the 7/11 and Ground from Penn Macaroni. Word of warning. The cans of Stanislaus 7/11 and Ground are MASSIVE! I don't know what to do with the rest of the can when I open one? I think I may pour into smaller batches and freeze? So my first dough is in the fridge and will consume the first pizza on Sunday. My boyfriend and I are really excited! We had little ceremonies with each tomato shipment as we put the cans away. LOL I am a pizza dork. Anyway I was curious - did anyone have any better luck with sourcing the tomatoes? Any words of wisdom? Also - what to do with the left overs from my giant can of Ground tomatoes! I mean they are like ten pound cans! Getting good tomatoes can be a bit tricky. San Marzanos aren't too hard to find in the 28oz cans. But the 7/11's, Saporito and other commercial brands from Stanislaus only come in #10 cans and are overkill. Tomatoes freeze well, so when I open up a large can, I immediately freeze the leftovers in smaller mason jars. When I need one, I take it out of the freezer, let it come to temperature, then prepare a sauce. Right now, we only carry flour on the Pizza Bible store (http://store.thepizzabible.com), but we're looking into offering tomatoes. Unfortunately, as you mentioned, the large cans and the shipping costs are a bit of a problem. We used the 7/11 as well. What we did was get enough of the other ingredients so that we could use up the whole can and freeze. I made a double Sicilian batch and then portioned out enough for (2) of the 13 oz pizzas. 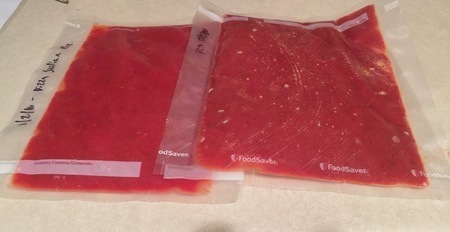 I vacuum sealed them so that I could freeze flat. It ended up being enough for about 9 dinners! It would be great if we can get the flour and tomatoes from one source to cut down on shipping! I am so excited about the possibility! I have only been able to find the tomato products called for in Tony's book from Pennmac. I like making batches of sauce and freezing them in the Reditainer Extreme Freeze Deli containers. You can find them on Amazon and they come in all different sizes, 8, 16, 32 oz. Thanks for all the advice. I ended up making some of the base sauce mix to freeze and also just froze the straight 7/11 and super heavy paste for future use. The two sauces tasted amazing. Can't wait to eat my first pizza's tonight.